We will continue to add more information as it becomes available. Our thoughts and prayers are with the climbers, rescuers, their friends and families.—Ed. On August 21 American alpinists Kyle Dempster (33) and Scott Adamson (34) left their base camp to begin an attempt on the North Face of the Ogre II (6980m) above the Choktoi Glacier in Pakistan. A day later, the expedition cook, Ghafoor Abdul, glimpsed their headlamps around the halfway point of their intended route to the summit. A storm rolled in on August 23, preventing any further sightings. The climbers were expected to return from their ascent on August 26. A search has been ongoing since August 28, with the help of another nearby climbing team, the Pakistani military, Global Rescue and local residents, among others. On August 31, a team of Pakistani expedition workers from the village of Askole started toward the other side of the mountain, from the Biafo Glacier, to see whether Dempster and Adamson might have begun a descent in that direction. According to a statement by Jonathan Thesenga at Black Diamond, the Askole residents are "equipped with extra food, sleeping bags, tent, etc, but the main goal is for them to visually inspect that side of the mountain and relay any information to search logistics team." Clouds and snowfall have prevented an aerial search until now, but a weather window is expected to open soon, allowing Pakistani military helicopters to look for the two men. In an outpouring of support for Dempster and Adamson, members of the climbing community and others have donated more than $180,000 to a GoFundMe site set up to cover the costs of the rescue: https://www.gofundme.com/2mjv38k. According to the GoFundMe page: "Kyle and Scott's rescue insurance will only cover a fraction (under $10,000) of the rapidly-escalating costs. We have already paid significant deposits for the helicopter and for porters to search on foot for Scott and Kyle. Please consider the urgency of this situation and how thankful we are for your help. Be assured that any funds in excess of actual search and rescue costs will be returned to donors." The current GoFundMe goal is now to raise $250,000. When Kyle Dempster and Scott Adamson attempted the same climb last year, they survived an arduous retreat from ca. 6600 meters after Adamson broke his leg in a thirty-meter fall. During the descent, according to Dempster's account in the American Alpine Journal, a V-thread anchor broke, and they slid another ninety meters. Both men are strong climbers, with vast experience on challenging terrain and reputations for endurance. 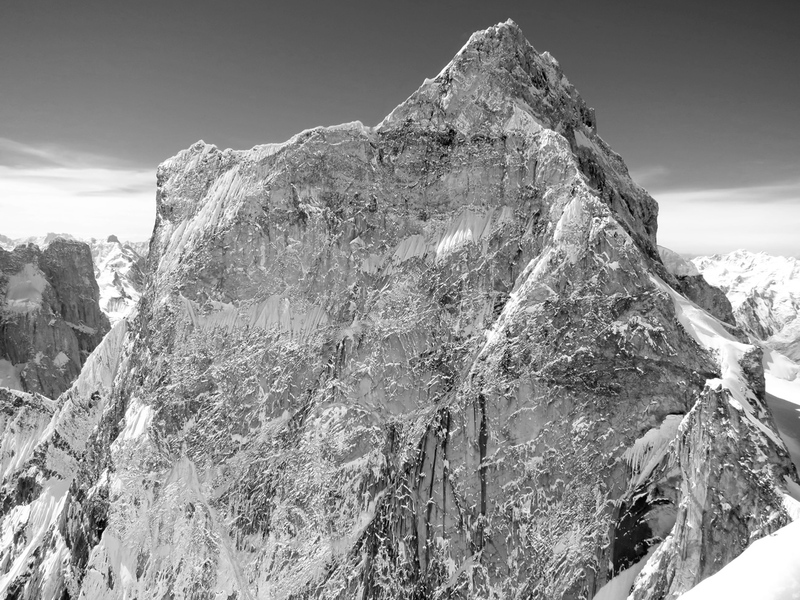 Dempster received his second Piolet d'Or for a 2012 first ascent of a new route (5.9X AI5 M6R) on the southeast face of Ogre I (7285m), with Hayden Kennedy and Josh Wharton. His first Piolet d'Or was for a 2009 first ascent of a new route (M6 WI5 5.7 R, 2650m) on Xuelian West, Tien Shan, China, with Jed Brown and Bruce Normand. Adamson has made first ascents on Pangbuk North (6589m) and Lunag West (6507m) in Nepal, as well as difficult new routes on The Mooses Tooth and Idiot Peak on Mt. Huntington (3731m) in Alaska. Dempster is a longtime contributor to both Alpinist's print magazine and Alpinist.com. In Alpinist 42, he described a difficult retreat from a solo attempt on Tahu Rutum, another peak in Pakistan: "After running out of food, I spent four days rappelling the wall and hiking back to base camp.... Strength existed only in my mind. Each time I fell, I had to find another memory with enough power to return me to my feet. The visions that guided me through this hallway were familiar ones. The faces of family and friends. The sounds of their laughter and the warmth of their love. The autumn leaves in the Utah desert and the sun on my skin. Red sandstone beneath my hands. A fiery sunset dancing and glowing in the sky." In Alpinist 50, Dempster wrote of the future: "I'm somewhere in the middle of my journey now. For me and for all of us, the road ahead is still in question, and I wonder, what will it become? The light, as I hope future climbers will discover, lies deep within ourselves. Alpinism, at its best, remains that simple movement through the hills with the brothers and sisters we love." Below are the current updates from Jonathan Thesenga at Black Diamond, who has been coordinating information about the missing climbers. "The search for Kyle Dempster and Scott Adamson is ongoing. This update for Friday, September 2nd and is provided in order to keep everyone informed of the efforts being made to locate Kyle and Scott. NOTE: all dates and times referenced are for Pakistan Standard Time. There is a confirmed weather window opening up as early as tomorrow morning. This is the first break in weather in 10 days, since Kyle and Scott were last seen. We have been in communication with the Pakistan military and they assure us that two Pakistani military helicopters will be starting the search tomorrow morning. A Global Rescue helicopter will also be on hand. We owe a huge amount of gratitude to the Pakistan government for scrambling all of their available assets and their commitment to finding Scott and Kyle. Their support, and that of Global Rescue, has been invaluable. Additionally Kyle and Scott's families are deeply grateful for the assistance provided by the Pakistan Embassy in Switzerland. It's important to note that without the help of the Pakistani military, Global Rescue, and the Pakistan Embassy in Switzerland, we would not be so well equipped to take advantage of this upcoming, and crucial, weather window.That is the update for Friday, September 2st. The next 24 hours will be crucial, and we again ask that everyone please provide privacy to Kyle and Scott's families. Any questions or media inquires should be directed to Jonathan Thesenga at jonathan.thesenga@bdel.com." "The search for Kyle Dempster and Scott Adamson is ongoing. This update for Thursday, September 1st is provided in order to keep everyone informed of the efforts being made to locate Kyle and Scott. All dates and times noted are Pakistan Standard Time. Snow and low clouds at Ogre II again kept the aerial search team grounded in Skardu. In addition to the Global Rescue helicopter, we are very grateful to have the Pakistani military now supporting the effort—they have helicopters at the ready in Skardu. Current weather forecasts for the Ogre II area show the potential for a change in pressure and possible weather clearing within the next 24-48 hours. The Pakistani military helicopters are prepared to get in the air as soon as a usable window of good weather occurs. The porters that have trekked up the Biafo Glacier from Askole to the backside of Ogre II should be in position to begin a visual inspection with binoculars by Friday, September 2. Kyle and Scott's rescue insurance will only cover a fraction (under $10,000) of the rapidly-escalating costs. We have already paid significant deposits for the helicopter and for porters to search on foot for Scott and Kyle. That is why a GoFundMe page has been established, which continues to see contributions from the global climbing family. The friends and family of Kyle and Scott wish to deeply and sincerely thank everyone for their concerns, contributions, and continued hope for Kyle and Scott. That is the update for Thursday, September 1st. The search effort is ongoing and we will continue to provide daily updates. We again ask that everyone please provide privacy to Kyle and Scott's families, and direct any questions or media inquires to Jonathan Thesenga at jonathan.thesenga@bdel.com." ""The search for Kyle Dempster and Scott Adamson is ongoing. We will be providing daily updates moving forward in order to keep everyone informed of the efforts being made to locate Kyle and Scott. Heavy cloud cover throughout the day did not allow the Global Rescue helicopter to fly into the area on Wednesday. We are currently working with several weather experts to obtain and compile actionable forecasts in order to help determine when the soonest weather window will be in which the helicopter could potentially do a flight.Additionally, we have hired a group of porters from the village of Askole to head up the Biafo Glacier, which leads to the backside of Ogre 2, in order to make a visual inspection with binoculars of the area that Kyle and Scott could have potentially been descending. The porters, who left Askole on Wednesday afternoon, are also equipped with extra food, sleeping bags, tent, etc, but the main goal is for them to visually inspect that side of the mountain and relay any information to search logistics team. We are all extremely thankful to the global climbing community for rallying their support behind the search. The GoFundMe page has seen overwhelming response and support, so thank you to everyone who has contributed. A stated earlier, the search effort is ongoing and we will continue to provide daily updates. We again ask that everyone please respect the needed privacy of Kyle and Scott's families, and direct any questions or media inquires to Jonathan Thesenga at jonathan.thesenga@bdel.com." "Early on Sunday, August 21, Kyle Dempster and Scott Adamson started up the North Face of the Ogre 2, just off the Choktoi Glacier in northern Pakistan. They planned on five days for the climb and descent. On Monday evening, their Pakistani cook, Ghafoor Abdul, spotted their headlamps roughly halfway up the peak. The weather remained good until Tuesday afternoon, when a storm moved in. Snowfall and cloudy conditions have persisted in the region since then. Kyle and Scott have not been seen since Monday, August 22, no surprise given the complexity and scale of the terrain and the vagaries of the weather. On Sunday, August 28, family and friends initiated a search and rescue effort, assisted by local authorities and another climbing team on the Choktoi. That effort is ongoing, and we'll post updates as more information becomes available. That effort is ongoing, and we'll post updates as more information becomes available. In the meantime, if you have contacts and/or resources that may be helpful, please contact Jonathan Thesenga, Jonathan.Thesenga@bdel.com."